If you see bright yellow powder on a plant – DON’T TOUCH IT! Myrtle rust is a serious fungal disease of plants. Although it is not present on the New Zealand mainland it has recently been detected on Raoul Island. This fungus has a wide host range within the Myrtaceae, a family of plants that include many of New Zealand’s most iconic trees, e.g., pōhutukawa, rata, manuka, kanuka and important introduced species like Eucalyptus and one of our favourite autumn fruits, the feijoa. 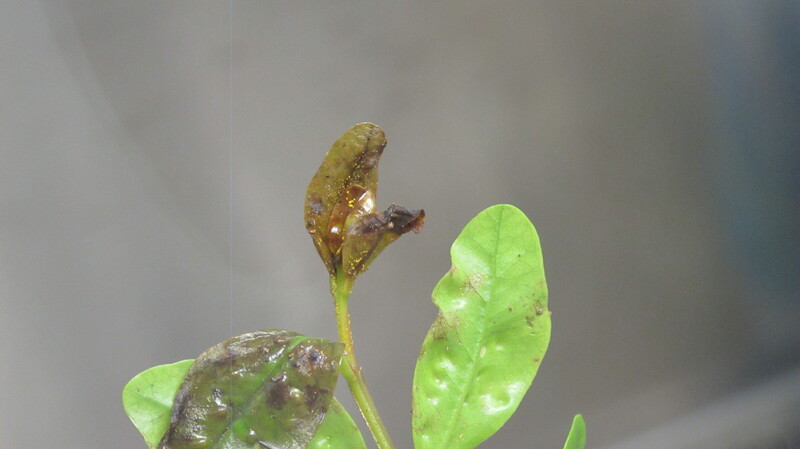 Myrtle rust often attacks fresh new growth and early infestations are characterised by yellow powdery eruptions on the surface of leaves as well as flowers, fruits, buds, and shoots. The spores themselves are microscopic so you won’t see them. However, don’t touch the yellow powder as you will coat yourself and your clothes in spores — potentially spreading the disease further. Further information can be found in this MPI fact sheet. Take a photo, log your observation on Naturewatch NZ. Don’t touch it and if you accidently come in contact make sure you bag your clothing and wash clothes, bags and boots when you get home. Immediately ring 0800 809966 and have your NatureWatch User ID or the observation ID on hand and MPI can quickly review your observation and provide additional advice. This rust is a serious issue and the earlier we can detect an incursion the more chance there is that something can be done about it. So remember, take a photo, log your obs and give MPI a call as soon as you can. Help protect New Zealand, get out there and keep looking. Myrtle rust is easy to overlook at first. Be sure to report any orange rust fungus you find on an plant in the Myrtaceae family. Photos © Ministry for Primary Industries (used with permission). Ugh!! 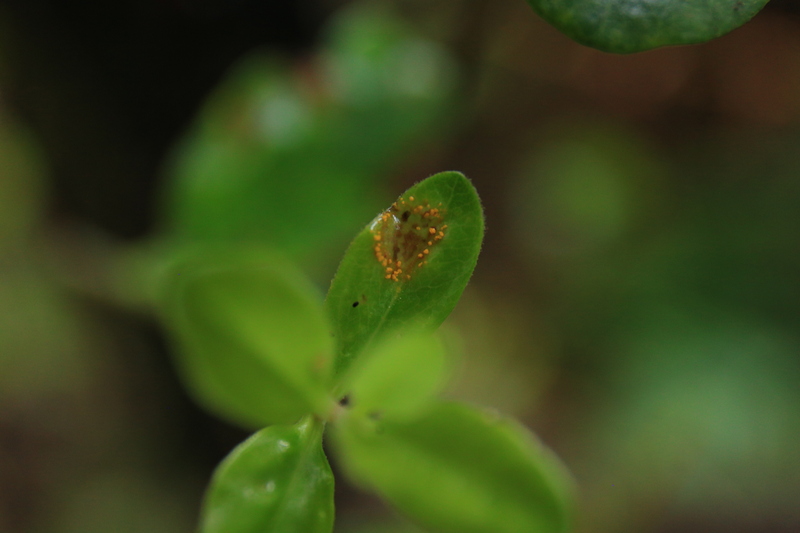 The pest myrtle rust has just been detected in Kerikeri, Northland. 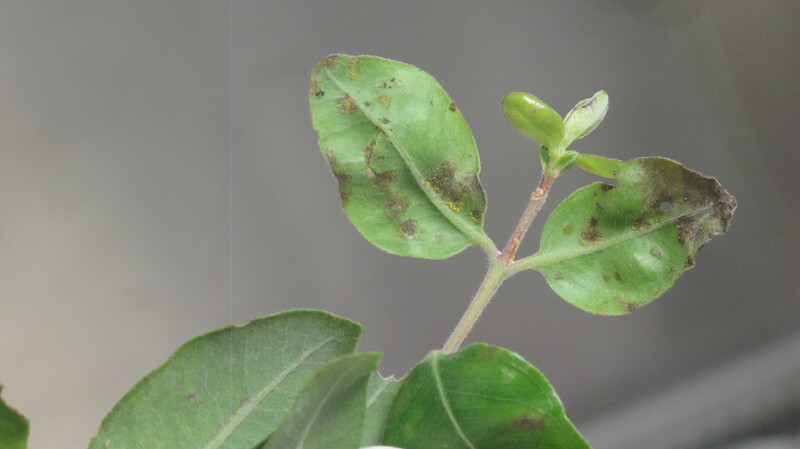 This Brazilian pathogen has caused a lot of damage to plants in the Myrtaceae family in Australia, like Eucalyptus, feijoa, and guava. It was recently detected on Raoul Island, north of the North Island, and now has been detected in Northland. The affected area is on lock down. Please report any orange rust fungus on any Myrtaceae, including pohutukawa and manuka, directly to the Ministry of Primary Industries via their biosecurity hot line, 0800 80 99 66.